It’s the Toxic Avenger’s 30th Birthday & You’re Invited! Celebrate at Bizarre AC with Lloyd Kaufman & Toxie June 13th-15th at the Tropicana Casino & Resort in Atlantic City, New Jersey. 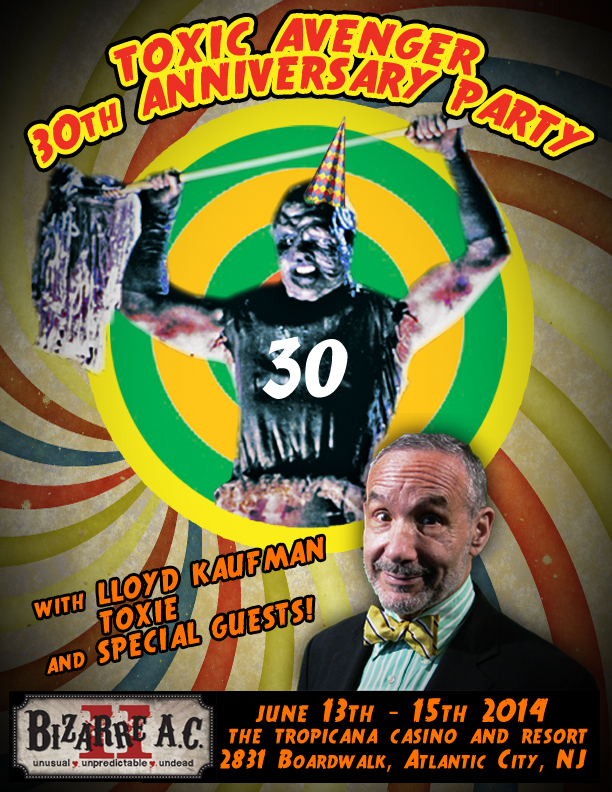 Plus a Special 30th Anniversary “Toxic Avenger” Screening with Live Color Commentary from director Lloyd Kaufman! Join Lloyd and the Troma Team June 13th-15th at the annual Bizarre AC! This Saturday June 14th, Troma Entertainment is proud to announce that we have been invited back to Atlantic City as Bizarre AC celebrates the Official 30th Birthday Party of New Jersey’s First Superhero, Lloyd Kaufman’s the “Toxic Avenger.” In addition to the milestone anniversary celebration there will be a host of other Toxie-riffic events to guarantee any Troma fan a weekend extraordinary entertainment. 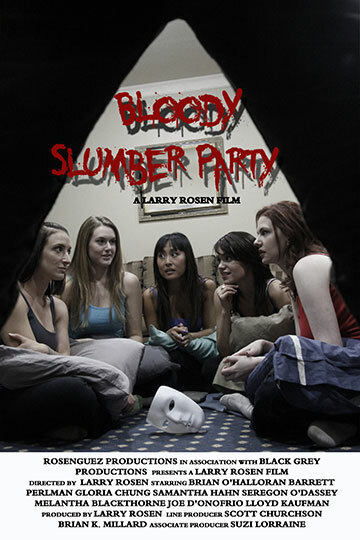 Beginning on the evening of Friday June 13th, director Larry Rosen will present his new film “Bloody Slumber Party” featuring a cameo appearance from the Troma President at 9pm. Following the Premiere Lloyd Kaufman will join Rosen and film stars Brian O’Halloran (“Clerks”) and Seregon O’Dassey (“Witches Brew”) to participate in a special crowd interactive Q & A session. Then on Saturday afternoon at 2pm in the Carousel Room there will be a special 30th Anniversary screening of the film that started it all, the original 1984 “Toxic Avenger” with a live color commentary from director himself, Lloyd Kaufman. 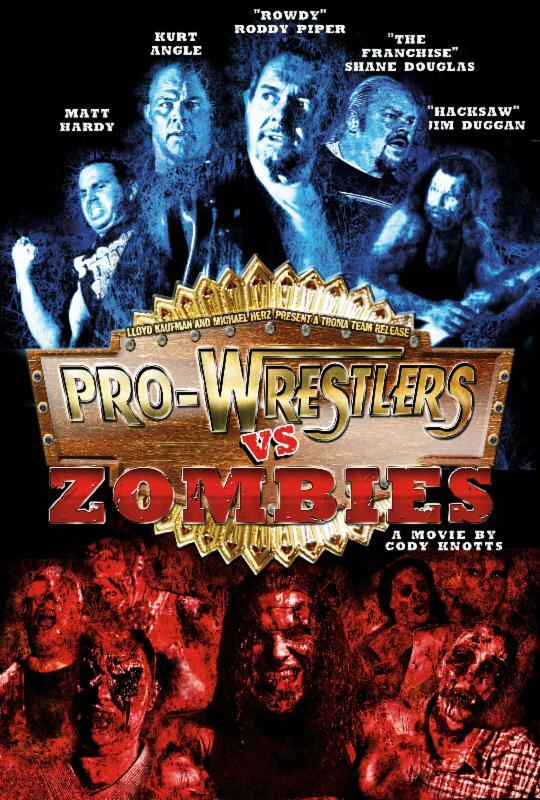 Later that evening, also in the Carousel Room, Troma’s “Pro Wrestlers VS Zombies” makes its Official New Jersey Premiere at 7pm starring confirmed Bizarre AC guest “Hacksaw” Jim Duggan. After the film director Cody Knotts and “Hacksaw” Jim Duggan will participate in a Q & A session with fans. 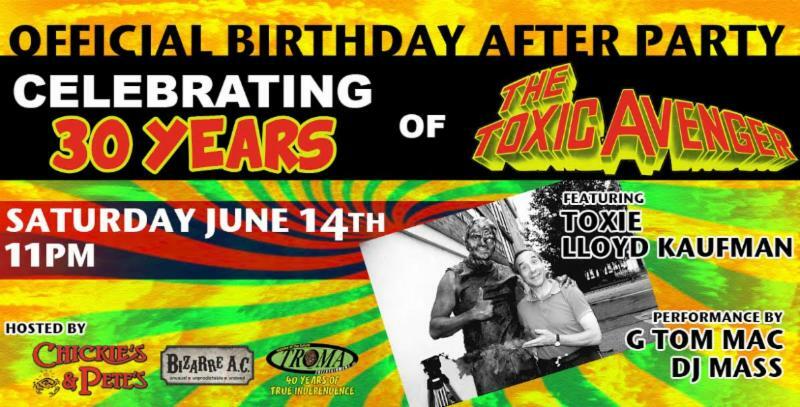 And after the doors close on Saturday night join Lloyd Kaufman, Toxie, and the Troma Team at 11pm at Chickie’s and Pete’s Sports Bar at the Tropicana for the Toxic Avenger’s Official 30th Birthday After Party. Music will be provided by DJ Mass as well as a Special Live Performance from G Tom Mac of “Lost Boys” fame! A special Birthday cake is being made by Food Network’s Chef Deb Pellegrino. There will be guest speakers and Lloyd Kaufman himself will say a few words to commemorate the occasion. Make sure to stop by the Troma Booth as it will be open all weekend for you to pick up all of your favorite movies, books, and posters. Lloyd Kaufman will be available for FREE Photo Opportunities and Signatures on any Tromabilia. Don’t miss your chance to celebrate this milestone year with us at one of the most fun weekends of the year, Bizarre AC! This entry was posted on Monday, June 9th, 2014 at 8:42 am	and is filed under Events. You can follow any responses to this entry through the RSS 2.0 feed. You can leave a response, or trackback from your own site. You are here : Home » events » 2014 » 06 » 09 » It’s the Toxic Avenger’s 30th Birthday & You’re Invited! Celebrate at Bizarre AC with Lloyd Kaufman & Toxie June 13th-15th at the Tropicana Casino & Resort in Atlantic City, New Jersey. 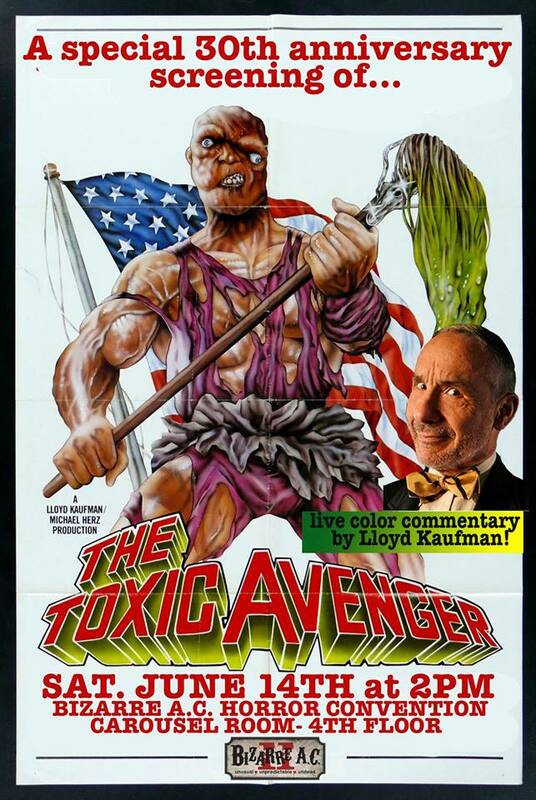 Plus a Special 30th Anniversary “Toxic Avenger” Screening with Live Color Commentary from director Lloyd Kaufman!